CITE AS: Chiz Harward, "Clay Tobacco Pipe Training," in 100 Minories, March 10, 2015, https://100minories.lparchaeology.com/clay-tobacco-pipe-training/ [Date Accessed: April 23, 2019]. 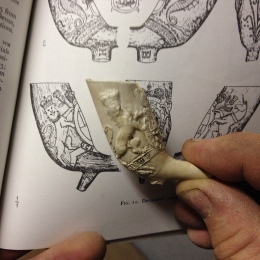 18th Century Clay Pipe with Hanoverian arms, showing the left side. 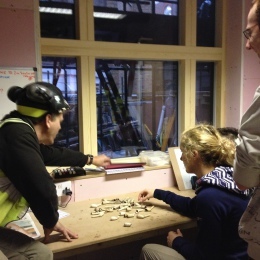 As part of the #100Symposium, we have been trying out different ways of training staff, developing skills, and increasing awareness of the various facets of the archaeology of London. At the start of site we ran a series of short handling sessions using an assemblage of unstratified clay tobacco pipes we had recovered during the watching brief phase. The collection of about 40 pipe bowls dated from the early 17th century to late 18th century and represented a good cross-section of undecorated pipe forms. Clay tobacco pipes (‘CTP’) are a ubiquitous find on post-medieval sites yet are often ignored by archaeologists focussing on earlier periods. The pipes are fairly fragile and regularly change form over time, which makes them a great dating tool as well as being intrinsically nice objects. Most of our site staff hadn’t dug up many clay pipes previously, and were mostly unaware of the great dating potential of pipe bowls in post-medieval deposits, as well as the subtle changes in form that indicate each pipe’s date. Instead of simply running everyone through the changes in form and style of pipes that occur over the centuries, we asked groups of two or three archaeologists to sort through the pipes and develop their own rules and typology with (hopefully) no prior knowledge of the definitive pipe typology developed by Atkinson and Oswald in 1969! We wanted the groups to discuss what features they could see on each pipe and what they thought these meant, to look at the pipes in detail, identify the features they felt were important, and compare the different permutations of size, shape, spur/heel shape, and decoration. The results over the five groups were very varied, a couple of staff already knew a bit about pipes such as that they generally get bigger over time, but generally the team had few pre-conceived ideas and came up with a range of interesting ideas such as that the smaller pipes were more expensive forms -as they seemed more ‘finished’ and therefore harder to make, that smaller pipes could be for women -or even children, and that pipes might get smaller over time as the technical ability to mould pipes improved and the smaller pipes often had rouletting decoration whereas the larger ones were usually plain. Some suggested that all the pipes could be contemporary and different forms were intended for sale to different markets. All groups identified the main features of pipes and used these to identify specific groupings, and they all had a good stab at forming a coherent typology. At the end of each session their typology, and the discussions behind it, was discussed before the ‘grand reveal’ when the ‘correct’ typology was unveiled and the differences run through with the group. All the team were given a printed handout on clay tobacco pipes, which includes a typology of London pipes so staff could identify pipes out on site. 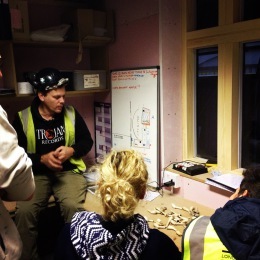 Hopefully the session gave the team a good introduction to pipes, as well as a detailed awareness of the features to be found on pipes and the issues involved in archaeological seriation and the development of typologies. 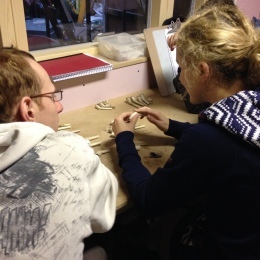 Interest in clay pipes has certainly increased since the sessions, and all the team can now ‘see’ the differences between pipes of different forms and know what details to look at, which is a fantastic result. Site staff can also now identify broad date ranges for clay pipes as well as recognise interesting or exotic pipes such as Dutch imports. This short handling session is typical of the type of fairly ad hoc training we are trying to provide to the team, taking place whenever and wherever the opportunity or need arises. We are aiming to get training embedded in the working week, and to make learning and the consolidation of skills and knowledge part of the normal working day. If you would like to view or download a copy of the Urban Archaeology Clay Tobacco Pipe Factsheet, you can do so here. Atkinson, D., Oswald, A., (1969). London Clay Tobacco Pipes. Journal of the British Archaeological Association 171–227.